Popcorn ceilings were once a popular trend in new homes and commercial buildings. It offered contractors a quick, easy and inexpensive way to finish sheetrock ceilings. Over the past decade, however, the use and popularity of popcorn ceilings has gradually been weeded out, as homeowners now prefer a cleaner, more modern decor. If you’re stuck with outdated popcorn ceilings in your home, the good news is that you can remove it in just a couple quick steps. Note: popcorn ceiling installed before 1979 may posses asbestos. If your home was built before this time, you should have it tested before attempting to remove it. Before you even think about removing popcorn ceiling, you should first prepare the room. This means moving out all of your furniture, furnishings and decorative accessories. Most people don’t realize just how messy popcorn ceiling is until they remove it. This stuff can easily stain and ruin your furniture and anything else it comes into contact with if you aren’t careful. When your room is clear, lay out some plastic covering or drop cloths across the floor. Check to make sure there’s no gaps or open spaces between the coverings, as debris can make its way through openings such as this. If necessary, tape the coverings together so it forms a complete barrier over the flooring. Next, you’ll want to spray the popcorn ceiling so comes off more easily. You can use a traditional garden sprayer with a solution of water mixed with mild dish soap, or you can use diluted vinegar. 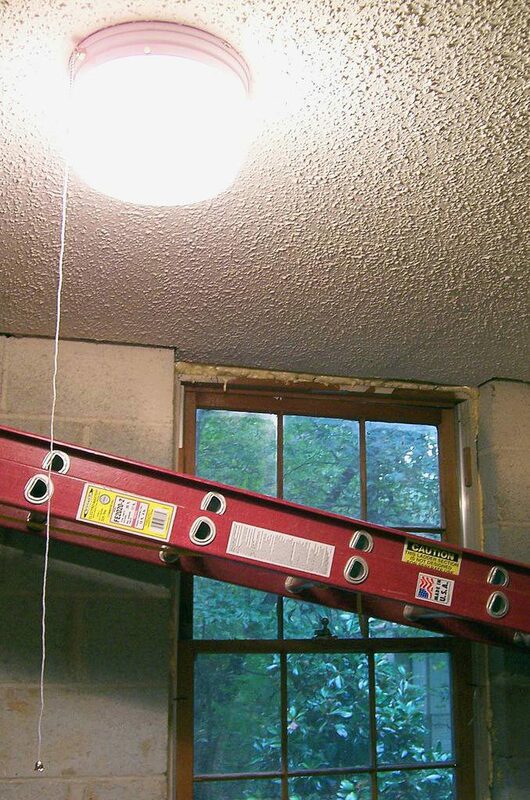 Both of these technique are highly effective at loosening up old, stubborn popcorn ceiling. Just remember to keep the sprayer turned down to its lowest setting; otherwise, you could end up getting water on your walls. Now comes the fun part of actually scraping the popcorn ceiling. Hopefully, you have access to a ladder, because you’ll probably need one to reach the ceiling. While the popcorn ceiling is still wet, use a putty scraper to scrape it off. The solution of soapy water or diluted vinegar should loosen it up so it easily comes off with a little bit of elbow grease. I recommend starting at the opposite end of the room and gradually working your way back up front. Press down with the putty scraper just enough to remove the popcorn ceiling without damaging the actual sheetrock.